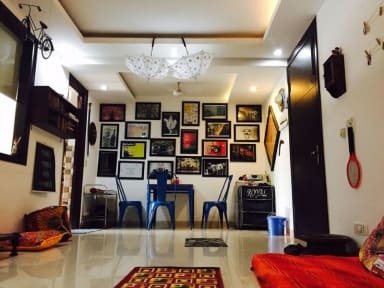 Our Hostel hope to play our part in promoting traveling and to create a trustworthy, fun brand in the process while taking along the local communities with us. The commercial hub of Gurgaon is very nearby. Situated in New Delhi, 3.7 km from Qutub Minar, Deli Tales features rooms with garden views and free WiFi. 11 km from Rashtrapati Bhavan, the property is also 12 km away from Tughlaqabad Fort. The property is set 13 km from Humayun's Tomb and 13 km from India Gate. At the hostel, the rooms include a wardrobe. All rooms include a private bathroom. The rooms come with a seating area. Jantar Mantar is 13 km from Deli Tales, while Pragati Maidan is 14 km from the property. The nearest airport is Delhi International Airport, 6 km from the accommodation.